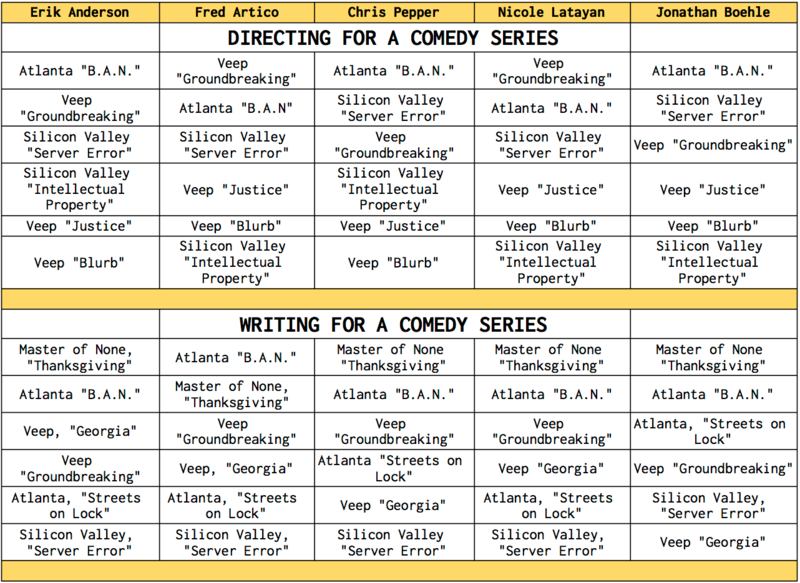 This year’s comedy categories at the Emmys sort of feel…flat. While some new blood has been injected (namely Atlanta) and others were shockingly snubbed (Transparent) there are only a few spots that seem up for grabs. Veep is winning Comedy Series again, full stop. The show won its third casting Emmy in a row last weekend, besting its (likely) closest challenger – Atlanta. Can Atlanta still top Veep? The critically acclaimed show won two Golden Globes (including Comedy Series), the Producers Guild and Writers Guild awards, the TCAs and was nominated by the Directors Guild. That’s a lot of hardware going into this weekend so why does it still feel like a distant second? It might be timing (Atlanta premiered a full year ago, Veep aired right before voting started) or it might be the air of politics and life imitating art that gives Veep the edge. It feels like Atlanta‘s best shots this year are in Lead Actor and Writing and/or Directing. The show’s creator and star, Donald Glover, seems likely to grab at least one of those. But Master of None, which won Writing last year, stands a very good chance at winning it again with its “Thanksgiving” episode written by show co-creator Aziz Ansari and co-star Lena Waithe (the first black woman nominated in this category). If Master of None had increased its nomination totals for its second season (and it really should have) I’d be leaning to a possible upset but not this year. As strong as Veep is in Comedy Series, Julia Louis-Dreyfus should be able to secure her sixth win in a row in Lead Actress. Allison Janney (Mom) could give her chase though. After winning twice in supporting she moved herself up to lead this year. It worked for her on The West Wing so she’s definitely a possibility. These women are both Emmy champs with JLD at 9 (including series wins) and Janney at 6, there could be an upset in the making. Fred and Jonathan have Tracee Ellis Ross (black-ish) in second so there’s another potential spoiler. The supporting categories are likely to go the way the guest categories did; to Saturday Night Live players. Alec Baldwin and Kate McKinnon playing Trump and Clinton during the most volatile Presidential campaign and election in modern history are clear favorites. Even if Clinton had won I think we’d still get them both as winners. Jonathan says pump the brakes on that though, as he is predicting Louie Anderson (Baskets) to win again. The Emmys do love repetition so it’s not a risky choice. Veep is nominated three times in directing again (really, TV Academy, you couldn’t find enough votes for Master of None or Insecure?) and the episode “Groundbreaking” has two votes from our experts against the three that are voting for Atlanta‘s “B.A.N.” episode. Like last year, Veep is nominated twice in writing but no one has it beating Atlanta or Master of None. Despite having the most nominations in the comedy category this year and last year, and as the reigning comedy series champ, Veep surprisingly has yet to win either of these awards. Part of the reason is that the television academy likes to reward freshman shows in these two categories, which is what might give Atlanta the edge here. 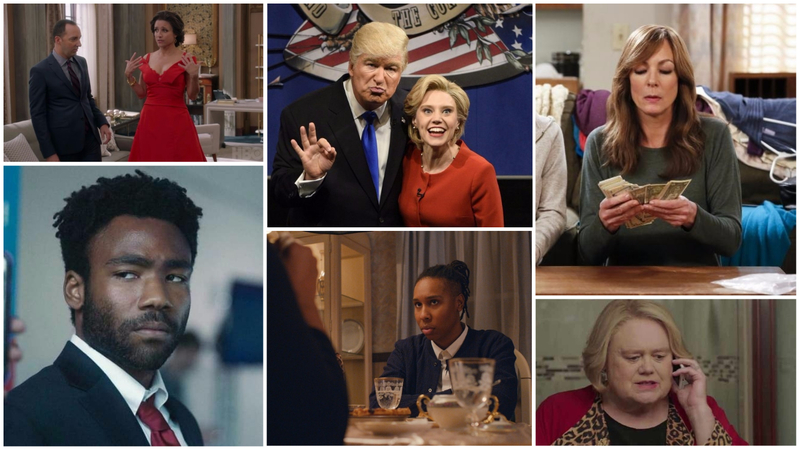 Here are the ranked predictions in the Comedy categories from the Emmy Experts. Keep an eye out for Limited Series/TV Movie/Variety/Reality predictions tomorrow and Drama on Friday.